Download "Descriptor. Legislation. Job roles. 1 P age"
1 1 P age This letter serves to outline the conditions and expectations of the training delivery and outcomes if you choose to undertake the BSB31107 Certificate III in Business Administration (Medical) utilising self paced study either by Distance Education or Online Descriptor This qualification reflects the role of individuals who apply a broad range of competencies in various medical administration contexts. They may exercise discretion and judgement using appropriate knowledge to provide technical advice and support to a team. 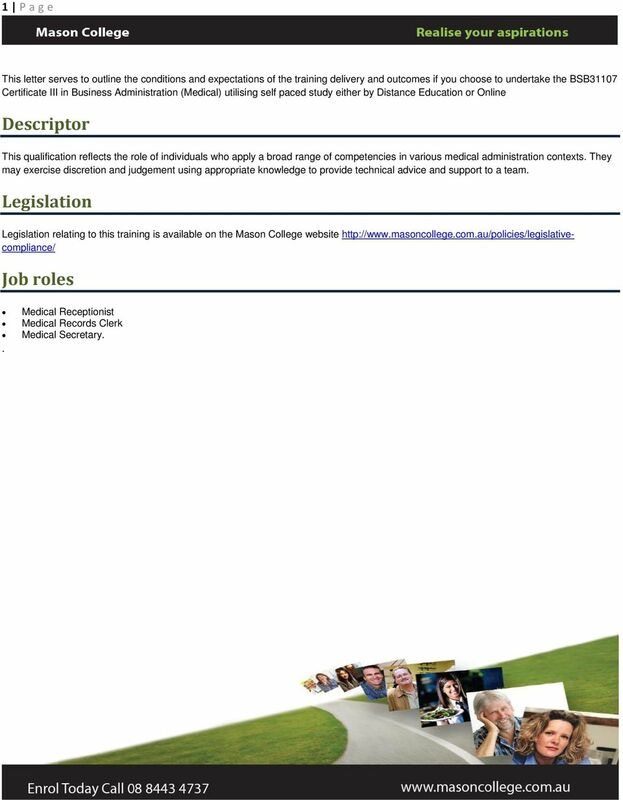 Legislation Legislation relating to this training is available on the Mason College website Job roles. Medical Receptionist Medical Records Clerk Medical Secretary. 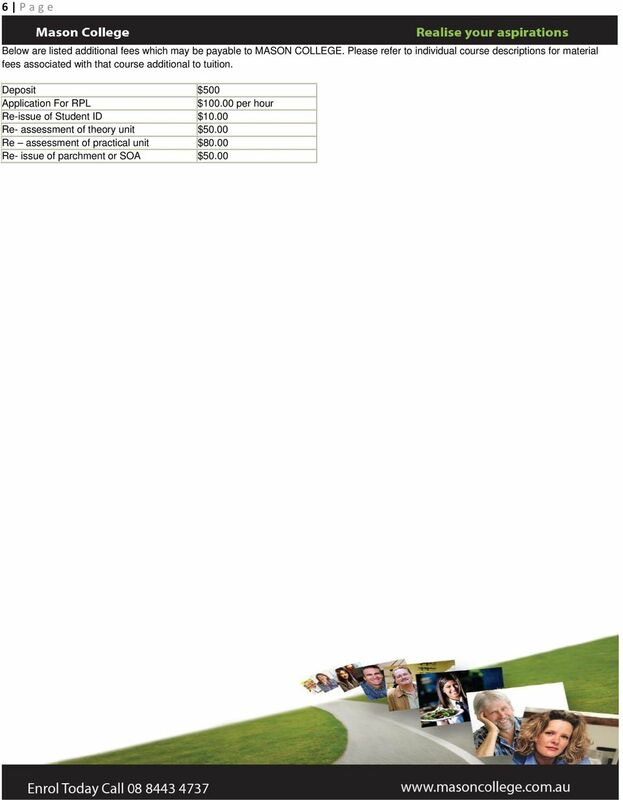 2 2 P age Pathways Information Pathways into the qualification Preferred pathways for candidates considering this qualification include: BSB20107 Certificate II in Business or other relevant qualification/s OR with vocational experience assisting in a range of support roles without a formal business qualification. Examples of indicative job roles for candidates seeking entry based upon their vocational experience include: Administration Assistant Clerical Worker Data Entry Operator Information Desk Clerk Office Junior Receptionist. 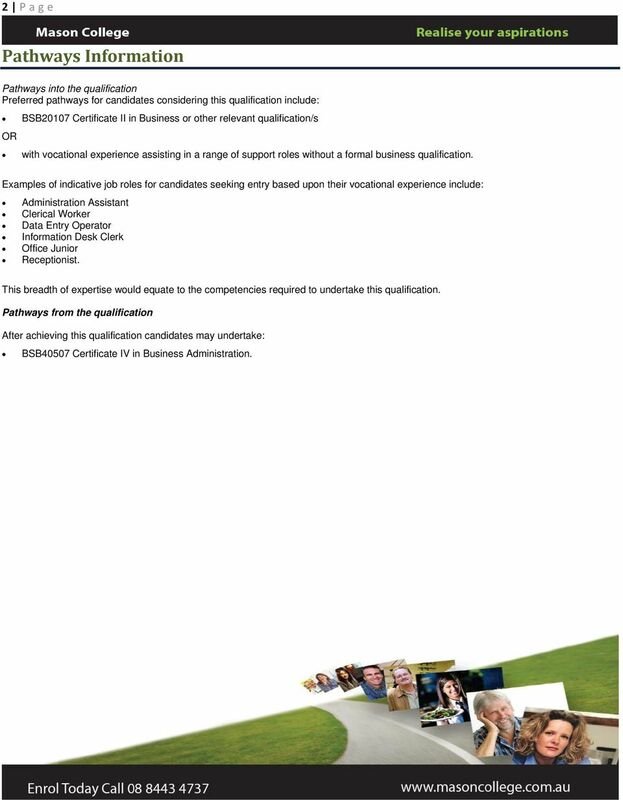 This breadth of expertise would equate to the competencies required to undertake this qualification. 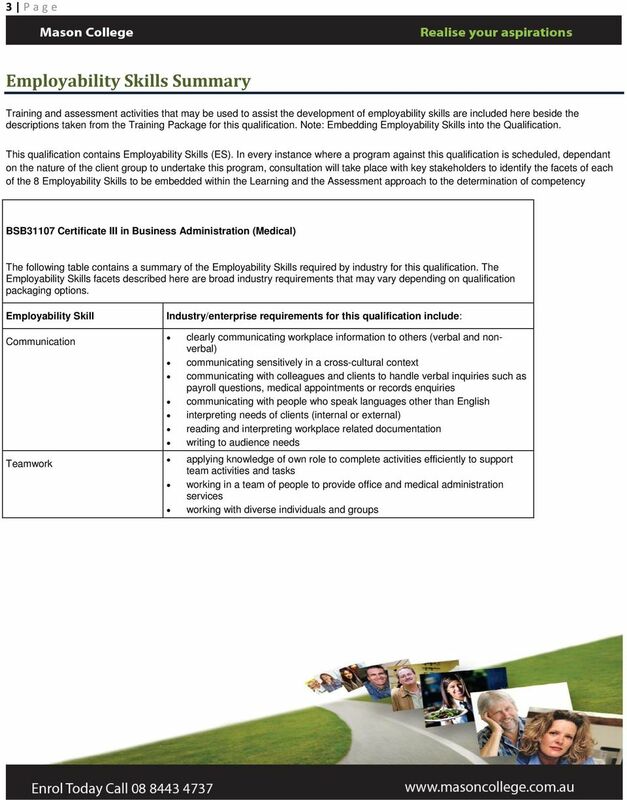 Pathways from the qualification After achieving this qualification candidates may undertake: BSB40507 Certificate IV in Business Administration. 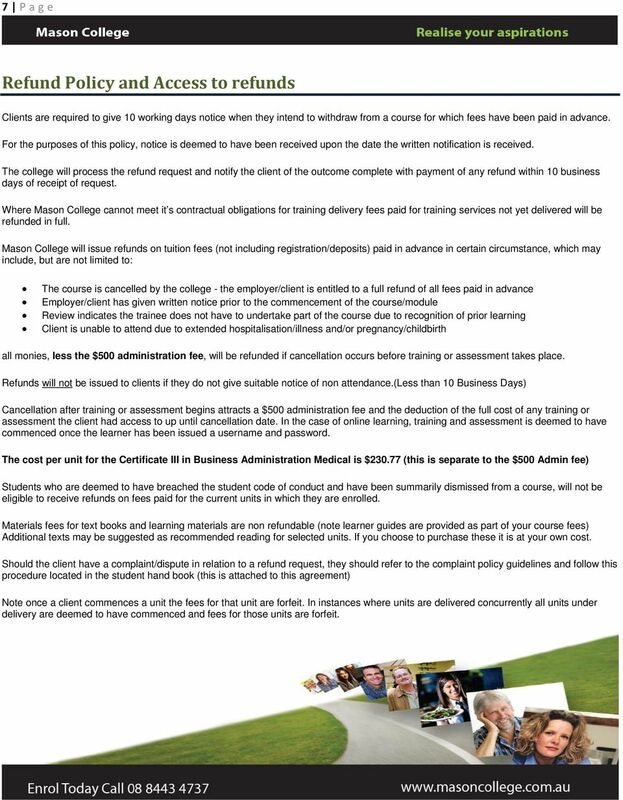 7 7 P age Refund Policy and Access to refunds Clients are required to give 10 working days notice when they intend to withdraw from a course for which fees have been paid in advance. For the purposes of this policy, notice is deemed to have been received upon the date the written notification is received. The college will process the refund request and notify the client of the outcome complete with payment of any refund within 10 business days of receipt of request. Where Mason College cannot meet it s contractual obligations for training delivery fees paid for training services not yet delivered will be refunded in full. 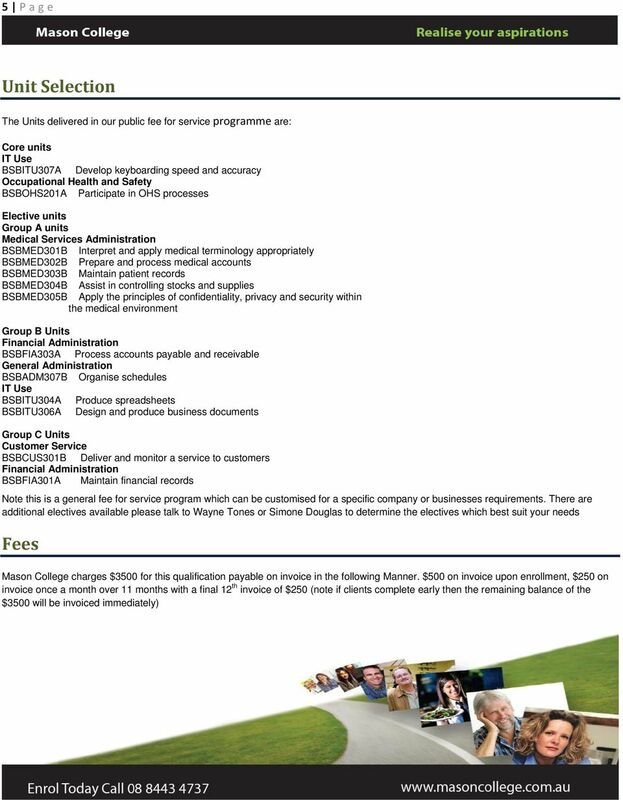 Mason College will issue refunds on tuition fees (not including registration/deposits) paid in advance in certain circumstance, which may include, but are not limited to: The course is cancelled by the college - the employer/client is entitled to a full refund of all fees paid in advance Employer/client has given written notice prior to the commencement of the course/module Review indicates the trainee does not have to undertake part of the course due to recognition of prior learning Client is unable to attend due to extended hospitalisation/illness and/or pregnancy/childbirth all monies, less the $500 administration fee, will be refunded if cancellation occurs before training or assessment takes place. Refunds will not be issued to clients if they do not give suitable notice of non attendance. (less than 10 Business Days) Cancellation after training or assessment begins attracts a $500 administration fee and the deduction of the full cost of any training or assessment the client had access to up until cancellation date. In the case of online learning, training and assessment is deemed to have commenced once the learner has been issued a username and password. 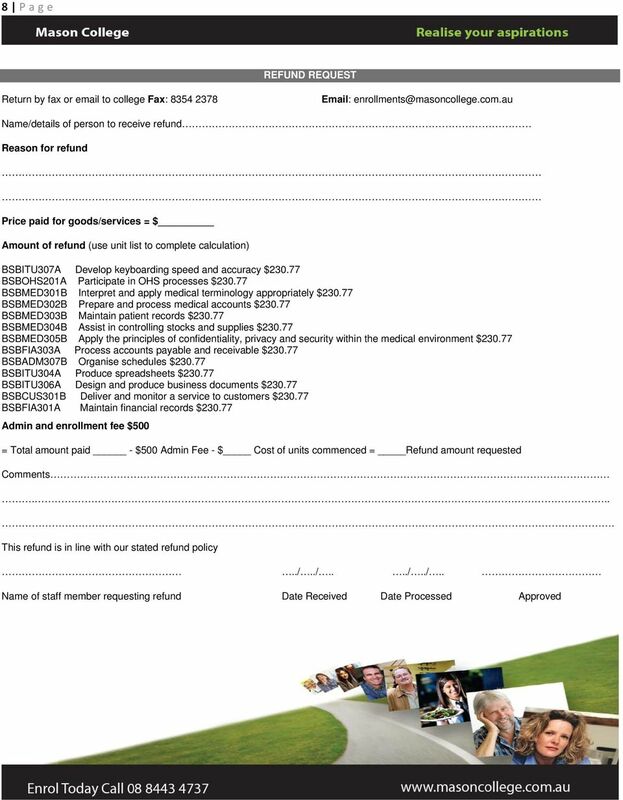 The cost per unit for the Certificate III in Business Administration Medical is $ (this is separate to the $500 Admin fee) Students who are deemed to have breached the student code of conduct and have been summarily dismissed from a course, will not be eligible to receive refunds on fees paid for the current units in which they are enrolled. Materials fees for text books and learning materials are non refundable (note learner guides are provided as part of your course fees) Additional texts may be suggested as recommended reading for selected units. If you choose to purchase these it is at your own cost. Should the client have a complaint/dispute in relation to a refund request, they should refer to the complaint policy guidelines and follow this procedure located in the student hand book (this is attached to this agreement) Note once a client commences a unit the fees for that unit are forfeit. In instances where units are delivered concurrently all units under delivery are deemed to have commenced and fees for those units are forfeit. 9 9 P age Complaints and Appeals Complaints 1. A complaint should first be lodged with RTO administration within 30 days of the issue arising, where practicable. 2. A written response will be provided within 21 working days. 3. Where the outcome is not satisfactory to the learner/client, the RTO Manager should be contacted in writing (mail/ ), setting out: The circumstances surrounding the issue Who was involved Why a complaint is being lodged Any evidence including dates and documentation The name of any witnesses who could support the case 4. Management will consider the complaint and the learner/client will be notified in writing of the outcome. 5. If the learner/client is not satisfied with the outcome, the complaint will be referred to an independent person, who is agreed to by both parties, and the learner/client will have an opportunity to formally present their case. Assessment appeals 1. Where appropriate the candidate should first approach the assessor concerned within 30 days of receiving the assessment result, where practicable. 2. Where the outcome is not satisfactory to the candidate, the RTO Manager should be contacted in writing (mail/ ), setting out: The circumstances surrounding the issue Who was involved Why an appeal is being lodged Any evidence including dates and documentation The name of any witnesses who could support the appeal 3. Management will consider the appeal and the candidate will be notified in writing of the outcome and the reason for the decision. 4. If the candidate is not satisfied with the outcome, the appeal will be referred to an independent person, who is agreed to by both parties, and the candidate will have an opportunity to formally present their case. Referrals In the event that a learner/candidate is still not satisfied with the outcome, they can contact the National Training Complaints Hotline on The Office of the Training Advocate is located at: Ground Floor, 55 Currie Street (entrance doors at Bus Stop W1 on Currie Street) Office hours: Monday to Friday 8.30am 5.30pm Phone (toll free) , The phone service is monitored after hours in urgent circumstances in urgent circumstances please leave a message so an officer can contact you as soon as possible. Post: GPO Box 320 Adelaide SA. 10 10 P age. 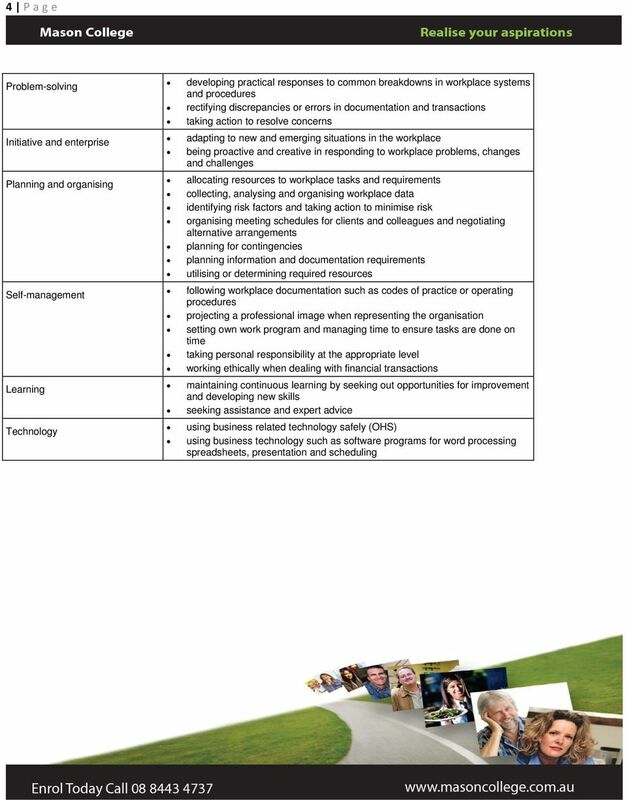 Training Delivery This program is delivered internally and externally over 12 months. 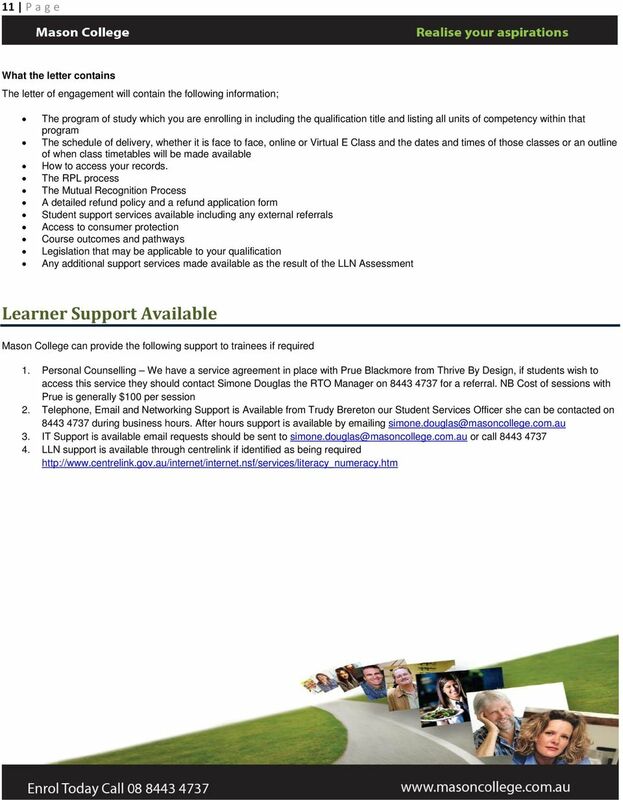 Mason College in consultation with the individual learner, will delivery this qualification either via internal (face-to-face), external (distance) (on-the-job). The units selected will be assessed according to the training package guidelines and will be conducted and assessed as appropriate. 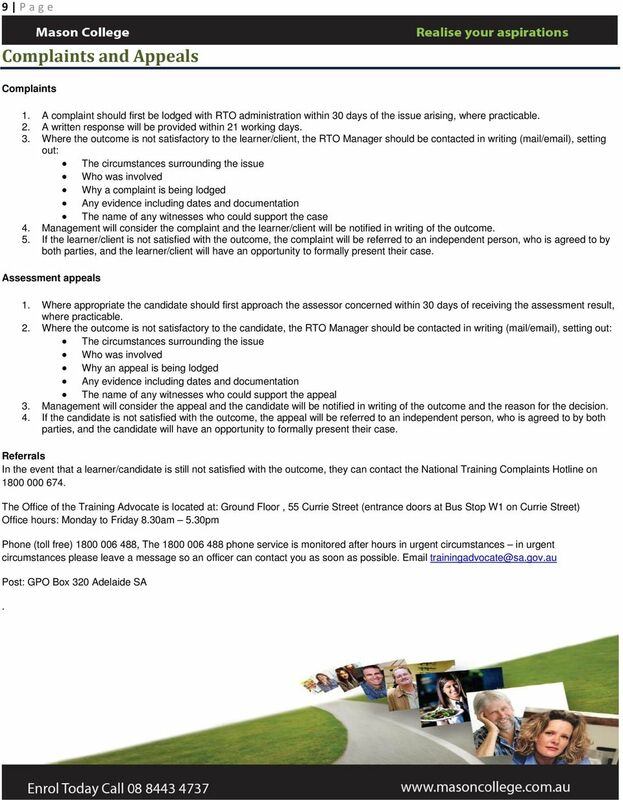 The Nominal Hours for this qualification are 490hrs The Enrollment Process Language Literacy and Numeracy Assessment As part of our commitment to supporting your needs and our adherence to AQTF Standards all students are required to complete a brief questionnaire as part of their enrollment application to allow us to make an initial assessment of their Language Literacy and Numeracy Skills in relation to the Australian Core Skills Framework and the demands of the program you are seeking to undertake. Based on this initial review by our LLN Officer your enrollment will proceed to the next stage or you may be contacted to complete an interview process to ensure that we can provide you with adequate support throughout your program of study. 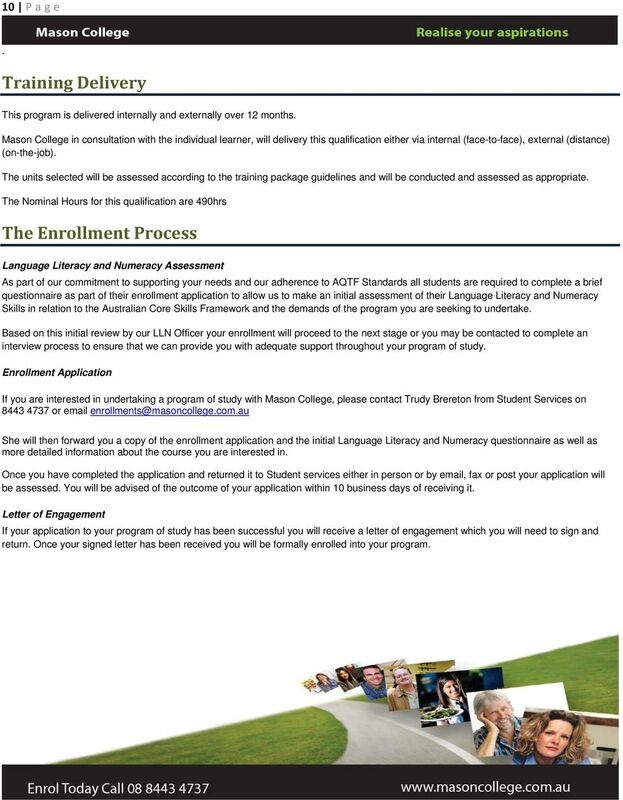 Enrollment Application If you are interested in undertaking a program of study with Mason College, please contact Trudy Brereton from Student Services on or She will then forward you a copy of the enrollment application and the initial Language Literacy and Numeracy questionnaire as well as more detailed information about the course you are interested in. 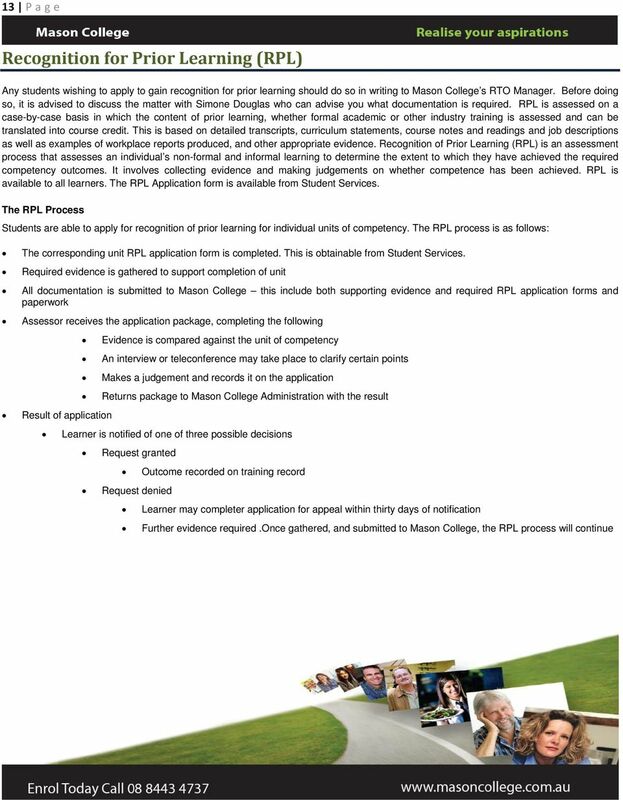 Once you have completed the application and returned it to Student services either in person or by , fax or post your application will be assessed. You will be advised of the outcome of your application within 10 business days of receiving it. 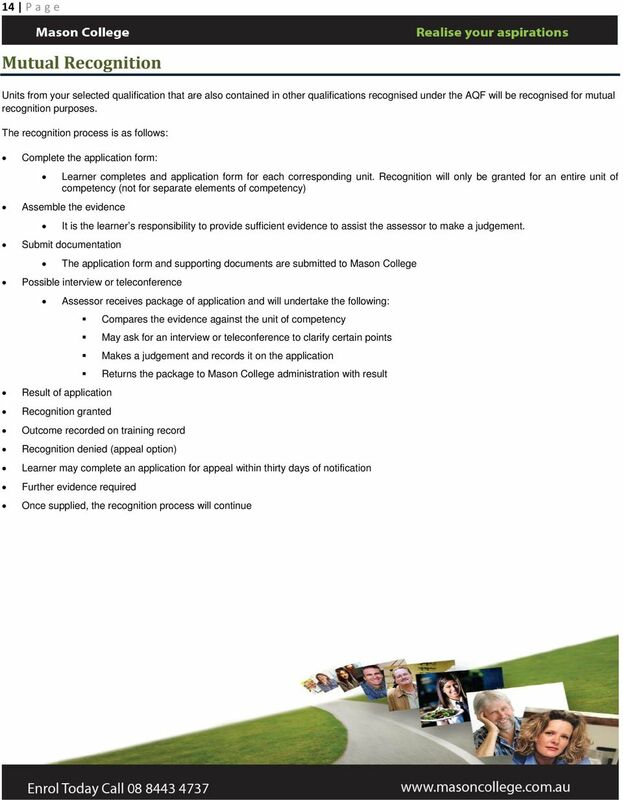 Letter of Engagement If your application to your program of study has been successful you will receive a letter of engagement which you will need to sign and return. Once your signed letter has been received you will be formally enrolled into your program.